The Market as it is known now began as a series of wooden market stalls built between 1803 and 1807. Its popularity declined towards the end of the 19th century, until the 1940s when an attempt was made to revive it. Changes were made again in 1972, but it was not until the 2010 rehabilitation that a comprehensive preservation was executed. Starting in January 2010 and completed in two phases, the three open sheds of the market, and enclosed shed behind Meeting Street’s Market Hall, were given a facelift, inside and out. 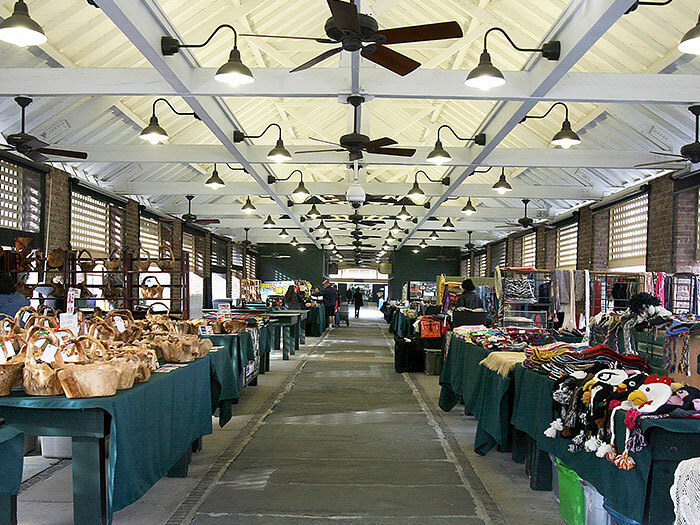 The circa 1824-1840 open market sheds A, B & C included repairs to the roof, repointing of all piers, structural improvements and the addition of public restrooms at Sheds A and C. The removal of parking and the introduction of a pedestrian way adjacent to each shed improves circulation and promotes display and sales to the exterior. Cross aisles were constructed to facilitate better access through the sheds, and the center row of vendors was removed to re-establish the original bluestone central path and aid the flow of foot traffic. In November of 2010, construction began on the second phase of the project, the 18,000 square foot Market Hall shed. Similar to the open sheds, new points of entry facilitate pedestrian traffic, and new lights and fans were installed. An 42 inch elevation change between Meeting and Church Streets was managed by a gradual slope within the conditioned space, and a series of accessible exterior ramps at the east end of the shed. The dark, individually accessed stores added in the 1970s were eliminated and replaced with individual vendor booths, all within a newly conditioned great hall. Daylight streams in from a new ridge skylight that runs the length of the space. The $5.5 million rehabilitation has increased foot traffic by both locals and visitors, improved circulation in and around each building and re-established the City Market’s presence in Charleston as well as solidifying its role as a National Historic Landmark.